You can choose from the Basic Yeah! Pack or the Oh Yeeah! Pack which includes trips, a meal pack and drinks. Choose the location from which you will join this trip. Madrid (285€) - A private bus will be provided to travel to Valenica only if a certain number of people choose to depart from this point, if they do not we will organise another form of transport for you. Madrid (399€) - A private bus will be provided to travel to Valenica only if a certain number of people choose to depart from this point, if they do not we will organise another form of transport for you. Would you like medical insurance? Choose the duration that you want it for and the type of insurance that you want! Click Here. It is time for one of this years most anticipated events! It´s time for international students from all over Spain to meet in Ibiza for this exclusive and unforgettable event. Don´t miss out on this trip. Get ready for crazy parties, fun in the sun and incredible beaches! WE ARE NOW GIVING YOU THE CHANCE TO GET A ISIC STUDENT CARD WHEN YOU BOOK THIS TRIP. SELECT THIS OPTION WHEN PURCHASING THE TRIP. What is the YEAH Ibiza Trip? The YEAH Ibiza Trip is one of the most anticipated events for students across Europe! What could be better than 5 days making unforgettable memories with students from all around the world? It is the best time to visit this incredible island, since during these days the island is not too busy. It is also one of the best locations for young people to go and party! Hundreds of students will gather at this incredible event, do you really want to be the only one who misses out? Prepare yourself for a few days of madess, an experience that you could only dream about! Are you ready? You will hop on our bus from wherever you are coming from in Spain to arrive in Valencia at around 9.30pm, here we will get on the ferry. At about 23:00pm the ferry will leave for Ibiza and our holiday will begin! Get ready because will not be a normal ferry trip, we will have a party on the ship that will last all night long until we reach IBIZA. We will arrive in Ibiza at dawn, hop back on our Unitrips bus and head towards our fabulous hotel… Ibiza Rocks***. Once we arrive we will check in and rest before the party starts! In the morning there will be a bit of time to rest or head to the beach before the first party starts at the hotel: the unmissable Nations Welcome Pool Party. This party will be full of different people carrying around the flags of their countires, hilarious games, good music and even more surprises! The party will start at 14:30 and finish at 21:00… so get ready!! After a crazy and unforgettable welcome party, we will have some free time to rest, eat and shower. At 00:00 we will head to the School Party. Go back in time and disguise yourself as a school boy or gril dressing in school uniform. Make sure you have a tie, skirt, glasses etc… Stickers and more surprises will also be coming your way! The party will start at 00:30 and finish at 06:00. This morning you have the option to get invloved in one of our optional activities, one that you don´t want to miss! We will leave by boat from San Antonia and head towards Formentera. Once there, we will have the entire day to explore the island. You can rent a car, motorcycle or bicycle to get to the different beaches on this island or you can walk if you prefer. We will have a meeting point on the beach of Ses Illetes for those who want to stay in a big group and have fun. If you do not participate in this activity you will have some time to explore Ibiza and do whatever you want. On our way back to Ibiza, at around 18:00pm, we will have the Sunset Boat Party. There will be drinks, music and we will also be able to watch the sunset from the boat…could you think of a better way to spend your evening? Even better, there will be time to bathe in the sea before the sun goes down! *This activity is part of the optional pack Formentera & Sunset Boat Party. Once we are back in Ibiza, we will have some time to rest and prepare ourselves for another crazy party at a world renouned club, get ready for the WATER PARTY at ES Paradis. An incredible nightclub in which we will dance the night away and for those who want to get wet, you can dance underwater, as part of the nightclub turns into something like a waterpark, with water everywhere! If you do not want to get wet do not worry, there are also areas where there is no water. This party starts at 00:00 and ends around 6:00. In the morning there will be an optional excursion for all of those who have signed up and manage to get up in time after a crazy night partying! At around 11.00am we set off on our bus to Cala Bassa, one of the most beautiful beaches on the west coast. With its incredibly blue waters and golden sand you cannot miss a chance to visit this dreamy beach. We will have some time to relax in the sun, have fun in the tea and eat something in one of the nearby restaurants. Those who don´t want to take part in this activity you will have the morning to do whatever you want. 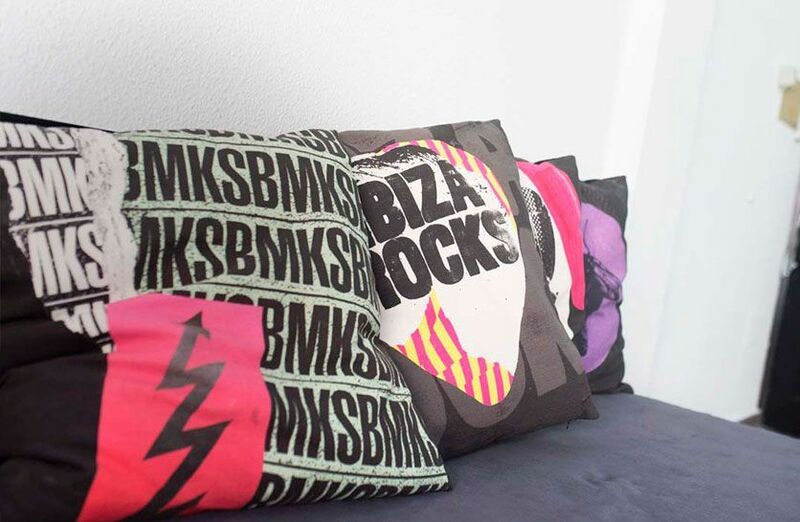 This party will take place in our hotel IBIZA ROCKS. Enjoy our Famous FOAM PARTY. Make sure you bring a swimsuit! We will also have the best music from the 80´s at our disposal, only fitting for the HIPPIE theme of the PARTY! DRESS CODE: Floral clothes, glasses, glitter, etc..
Let´s go out with a bang! Say goodbye to this trip in one of the most famous clubs on the island: AMNESIA. In this club there are two different types of music to choose from: electronic or reggaeton. Enjoy this final party and dance until dawn! It time for this incredible experience to come to an end. So pack your bags and prepare yourself to head back home. After check-out at 10:00am we will go to the port of Ibiza to catch the ferry to Valencia. On the ferry we will have one last Boat Party for those of you who have enough energy left! Once we are in Valencia, everyone will travel back to their city by bus. Those who have come by plane, may have to stay for a bit longer until the departure of your flight. 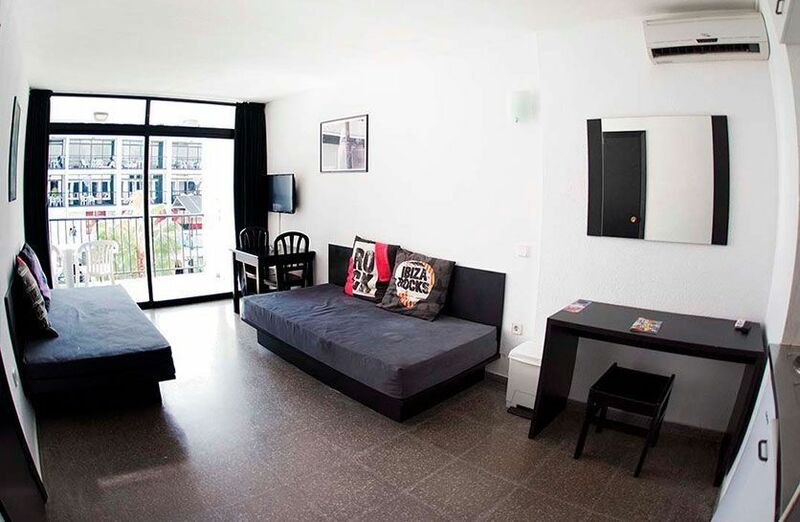 The accommodation during this trip will be in one of the best hotels for events in Ibiza: The Ibiza Rocks Hotel, where every year pool parties of all kinds are organized for people from all over the world! All of the parties (except the party included in the optional excursion Formentera & Sunset Boat Party) are included in the price. We do not offer any party, if is isn´t the best possible price for this time of the year and if it´s not in the best clubs on the island. Make sure you bring all of your energy and desire to party as what awaits us is… the EXPERIENCE OF A LIFE TIME. On the first day we will have the first party at the hotel. NATIONS PARTY. Pool games, entertainers, confetti and much more to welcome you to this great event. Bring the flag of your country to celebrate the first party of the trip! In the evening we will have the SCHOOL PARTY, where everyone will disguise themselves as a school girl or boy. Stickers and lollipops will be distributed ! DRESS CODE: Glasses, tie, suspenders, white shirt, skirt, etc. This party is for those who have paid for the extra activity, trip to Formentera for 30€. At the end of this trip we will have a Sunset Boat Party, with music, a bar and we will also have the chance to watch the sunset. Tonight we will have one of the most famous parties of the trip: The FIESTA DEL AGUA. You can bring a bag with you to change if you want to get wet, but it is not mandatory. One of the craziest parties you will ever experience. DRESS CODE: Swimming trunks, floats, etc. For those who are going to travel by ferry from Valencia to Ibiza, when buying the trip from anywhere in Spain, they will have a fantastic party on the ship that will last all night on the way out, and also on the last day during our return journey to Valencia. We offer you various different trips to make this experience even better! You can choose to do them all or only a select few! A paradise made up of transparent waters, beaches full of dunes and pines that will leave you speechless. The excursion will begin in San Antonio by boat to the island, so we will not have to travel to the center of Ibiza. From there you can rent a car, motorcycle or bike to get around the island. On the way back, we will have a party on the boat with music, a cheap bar (pirce includes one free drink) and we will also stop to watch the sunset whilst you bathe in the sea, if you wish. Excursion to one of the most beautiful beaches on the west coast surrounded by a forest. Turquoise blue waters and golden sand. Without a doubt, this is an experience that you cannot miss. At 11:00am we will leave by bus to Cala Bassa where you will have time to sunbathe, play beach games, that we have prepared, and eat at one of the bars in the area. This excursion will end at 4:00 PM, after which a party is scheduled. If you would perfer not to participate in the scheduled excursions and you want to visit the island at your own pace, we recommend renting a motorcycle or a car and visiting places like the hippie market of Las Dalias or Es Canar. You should also go and explore the wonderful islet of Es Vedrá which is almost 400m high or visit some of the most beautiful coves on the island such as Benirrás, Es Caló des Multons, Cala Xarraca, Cala de Sant Vicent. etc. There is a lot to visit on the island so do not sleep too much… instead go and explore Ibiza! You can also choose from various departure points: Madrid, Barcelona, Valencia, Murcia, Cartagena and Ibiza. 3 nights in a standard room. Joining us in Ibiza? We will meet you at the hotel for check-in. Meet us at the Port of Valencia to catch the ferry from Valencia – Ibiza (round trip)with a party on board included. With a bus from Madrid – Valencia (round trip) and a ferry from Valencia – Ibiza (round trip) with a party on board included. Meet is in the Port of Barcelona where we will catch a ferry fromBarcelona – Ibiza (round trip) with a party on board included. Everything that is not included in the details of the packs.